Uses: temporary holds fabric, interfacing, felt, paper. 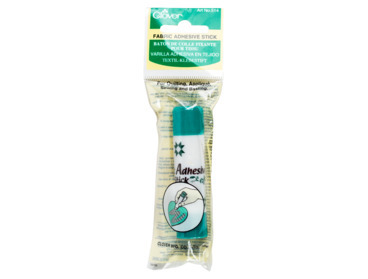 Clover fabric adhesive glue stick. Temporarily holds appliques, fabric, interfacing, paper, and felt in place. Glides on easy and won't gum up your sewing machine like other fabric glues. Use it like you would a basting stitch. Allows for easy repositioning of your materials if necessary. adhesive stick Fabric Glue has been added to your cart.